The inexpensive costs and convenience of plastics have created an abundance of useful plastic products for homes and businesses. Many people have switched from old galvanized pipes and expensive copper pipes to PVC pipes for plumbing and landscaping needs. * Lightweight– Compared to other piping materials, PVC pipes are lightweight and easy to carry without a large crew of workers. They are easy to install without risk of injury from sharp edges and frayed metal joints. * Non-Corrosive – In pipes that carry drinking water, corrosion is a harmful threat to your health. PVC pipes will resist corrosion and rust that often builds up in galvanized pipes to keep your drinking water clean and safe. 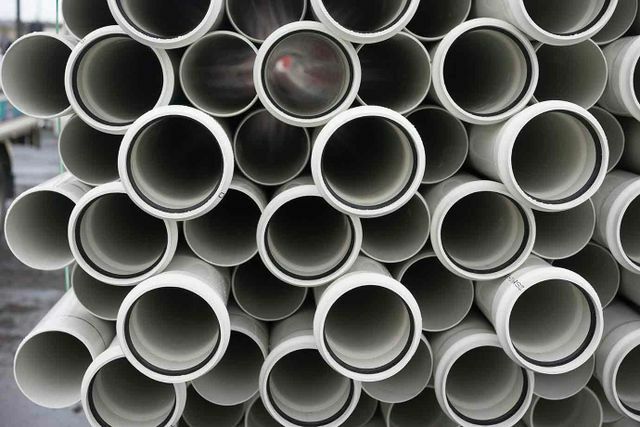 * Chemical Resistant – PVC pipes have excellent resistant to harmful chemicals and disinfectants including alcohol, alkalis, acids, fluorides, fats, grease, mineral oils, and cleaning solvents that often pass through water pipes. * Flame Resistant – Without a high heat source of at least 450 degrees, PVC pipes are flame resistant and will not burn. This features makes them easy and safe to work on for a variety of home and industrial uses. * Watertight Joints – Compared to metal pipes, PVC pipes have great, watertight joints that resist water leaks. Since sections are joined with solvent cements and tight fitting joint gaskets, they prevent leaks and breaks from water pressure. * Longer Life – Because PVC pipes resist chemicals and corrosion, they can last up to 100 years if well maintained. A longer life means lower maintenance costs and more efficient water use for your home or business.